I have to admit I’m developing a fixation with Australia. To my defense though, data releases are supportive of my thesis. Take the last couple of days for example: the AiG manufacturing index crossed 50, suggesting a contraction in the sector, the trade surplus declined on account of China’s worse than expected economic performance, building permits declined by 9.1%, and the construction sector continues to be in the red for the fourth consecutive month. Retail sales a growing a bit but then PCE was also positive for the US until mid-2008, almost halfway through the recession. To be fair, I pretty much considered that nobody in the markets paid attention to the Aussie. However, my opinion changed drastically once I took notice of the Aussie behaviour through the past year. The currency has significantly weakened over the year, as markets have been heavily discounting it: from the market close value on the last week of 2017, to the market close value in 2018 the Aussie lost 10.1% of its value against the Dollar, 4.7% against the Euro, 14.7% against the Yen and 3.6% against the Brexit-ridden Sterling. The AUS200, while not completely reliable as it followed the overall stock market trends in the world, also lost 7.4% of its value through the year. 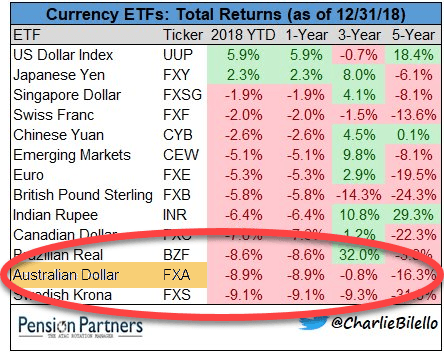 The Aussie was the worst overall performer throughout the year, second only to the Swedish Krona, accumulating a 8.9% loss. It’s true that I’ve said it before, more than once actually, but I’ll reiterate it once more: Australia’s housing sector is in trouble, and this will likely affects its banks. There is still time until the ultimate bust, but 2019 will definitely be a very interesting year for the country. Once the economy goes into recession, things will get tough. Ironically, the RBA interest rate is already too low for any meaningful action (plus the recession will be supply- and not demand-driven), so it will have to resort to QE, which will not really help the economy given that banks will be unwilling to lend. Thus, the only other option would be a bailout. More on this in the future.